I'm turning another year older. Hopefully, a little wiser seeing that more grey hair and wrinkles are popping up at an alarming rate. Since I'm such a gadget queen, I thought that this is the perfect excuse to add yet another electronic device to my burgeoning collection. 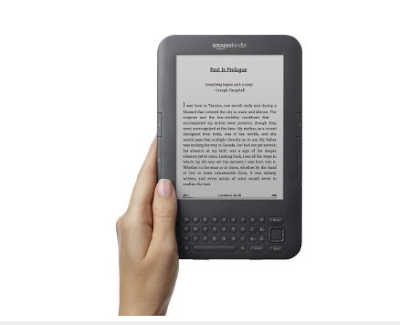 The Kindle from Amazon. I've downloaded the iBookstore application onto my iPhone and purchased a couple of iBooks to try out. I am pleased that I no longer have to lug around thick novels in my overstuffed handbags. However, with only 16G space on my iPhone, there's only so many books I can store on my phone. Unfortunately, reading a book drains the batteries as quickly as surfing the net. The new Kindle stores up to 3500 books with the battery life of a month. This might solve my storage problem as it holds more books than my bookshelf! What was the price of the Kindle? QY and I was debating the e-reader or the iPad, - he's tempted but resisting. How is it? The only e-reader sold in NZ is something called Kobo, which comes with 100 free classics. I'm tempted, but I just want to play with someone's first! I saw the iPad but wasn't all that impressed. I can't imagine putting something like that in my purse because I want to read when I'm on the train or plane. I've seen a friend's Kindle and really liked it. So much easier to use. It's £109 without the 3G.